It has become a cliché that babies should come with an instruction manual. As experienced educators, my wife and I felt like we had a plan for how to handle the little bundle of joy that tumbled into our lives over two years ago. We’ve taught and disciplined hundreds upon hundreds of kids between the two of us. Surely we could handle one very small one? Alas, the nature of parenting is to second-guess every decision you make, pretty much every step of the way. We wanted to do what was best for our son–all the time, every day. But how did we know what was best? How could we be sure. So we turned to the experts. Offer acceptable choices. Toddlers want to feel a sense of power and independence (like the middle schoolers I teach) so choices work great to achieve this and still get them to do what you want. The trick is to ensure that you are offering choices you can live with. Don’t say, “Do you want to go to bed now?” because the answer is probably no, and then you’re in for a fight. Instead try, “It’s time to go to bed. Do you want to walk upstairs yourself or do you want a piggyback ride?” See the difference? I don’t care which one he chooses…both get him upstairs for bedtime. Talk to your child. This may seem like a no-brainer, but bear with me. My little boy is not quite two and a half, and even before he hit the two-year mark nearly everyone we met was marveling at his skill with spoken language. He speaks very, very well for his age. Embarrassed by the compliments, my wife and I usually just say, “We talk to him a lot.” But it’s true. We talk to him all the time. We read books together. We discuss what we see going on around us with him–and encourage him to talk back. Even when he watches TV, we ask him to tell us what’s happening in the show–we watch with him and talk about it. I was thrilled to see this exact approach to language development recommended in Positive Discipline. These are just a few nuggets of wisdom from the book that resonated with me as both a mom and an educator. There is SO much more, and I’m really looking forward to employing some of the other advice for stages we haven’t quite gotten to yet (there’s a whole chapter on potty training!) For me this is the essential guide to nurturing your child with love and structure as he or she grows. I highly recommend it to everyone, and will be giving it as a baby gift to new parents from here on out! 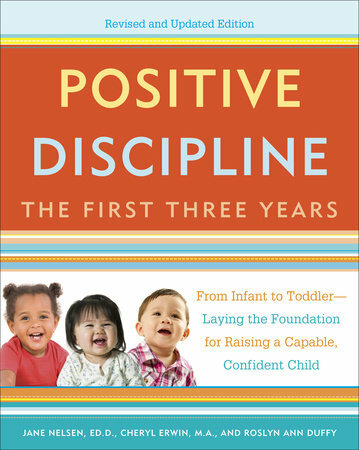 I received a complimentary copy of Positive Discipline: The First Three Years from Blogging for Books in exchange for this review. However, my opinions as stated above are my own. Next Next post: I (Still) Hate the Dentist! I’m very excited to learn that Blogging for Books is a thing. I have been reading a lot of books on behavior and discipline, some recommended by her therapists and others just ones I have picked up. I haven’t read this one yet, but like the points made so I will be checking it out today. Thanks.